What a show...Sammy,Michael and band rock! Happy B-Day Sammy, you look great!! Many Thanks to Jorge,Paulo,Roberto,Carlos(security Roberto and Alberto), Christopher, chef Miguel and staff for great times at Cabo Wabo Cantina. Special thanks to Cabo Uno Band (you guys are awesome!!! )for letting Ernie and Lou(www.throughthedoors.com) play Doors music with you... fun nights closing Cabo Wabo! See you next year. 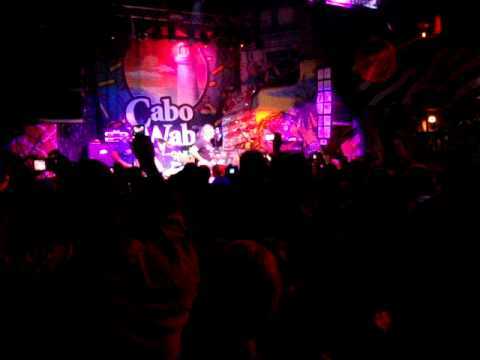 Our 1st time at Cabo Wabo for Sammy's b-day bash. It was on the 8th Oct. Great time and memories. Wish we got there earlier for better standing room. All of Sammy's staff are very accomodating and thoughtful. Saw Sammy with Kenny Chesney at Gillette Stadium a couple years back. 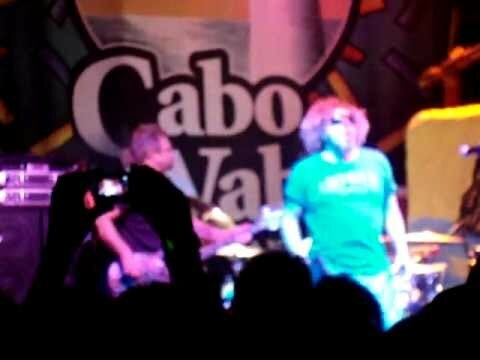 Whoda' thought we'd make it to Cabo for another "Red Rocker" show in his club with Michael Anthony. Wow! Hope to make it next year too. Thanks to Jorge, Paulo, Roberto & Carlos for everything. Even though we've been home a few days our heads are still in Cabo. You know what I mean. Would love to get the band down there. THE BEST PARTY IN CABO IN THE BEST PLACE. THE BEST OPTION FOR STAYING THERE IS TESORO LOS CABOS, JUST A FEW STEPS FROM CABO WABO. Glad to see that there is at least someone else staying at the Finisterra. Me and my wife are coming from just outside of Richmond, VA also leaving Thursday staying through the weekend. Can't concentrate at work already with Cabo just days away! My wife and I are leaving St Louis for Cabo on Thursday, so we'll see you guys for shows on the 8th and 9th! Staying at the Hilton Thursday night then moving into town for the remainder of the weekend at the Finisterra, just around the corner from the Cantina. Can't wait to see all the Redheads! See you all in a few days !!! Congrats now Brother Redhead, I'll be face down. can`t wait it`s killin' mee lmfao 6 days 4 shows ..yeah baby,hope to make it home alive ..
michaelr045 - Just dinner tix will be up for sale. My wife and I are coming down for the 8th and 9th shows, cannot wait!!!!!!! Are there going to be any extra tickets at the door for the day of the show? Went to the B-Day Bash in 2006, and had a Great time. Please comment back if there will be tickets available in Cabo. Almost a month away. I'm so excited!!!! need tickets for Oct 8 or 9 where can i buy them. this will be my first trip in oct new redhead,seen sammy back in 80' with ted nugent,looking forward to it. It certainly CAN NOT get any better than our wedding sandwiched between two Sammy shows. WOO! I'll be celebrating my birthday in Cabo at the concert on October 8th :) Can't wait!!! JUST WANTED TO SAY THANKS TO SAMMY FOR MAKING IT POSSIBLE FOR EVERYONE TODAY TO GUARANTEE THEMSELVES THE OPPORTUNITY TO CELEBRATE WITH HIM ON HIS BIRTHDAY!!!! YOU ROCK SAMMY SEE YOU IN CABO 10/8 & 10/9 BOTH SHOWS! I will be in cabo that week, where can i buy ticks????? 3) See Sammy again on the 13th with my Mrs.
Can life get better...I submit it can not! Hope to do some shots with fellow Redheads. We are in on the 8th...my Birthday! Can't wait! Going to be there from Oct 4th-12th...4th time and can't wait!! Sammy rocks and I haven't been since 2007 and I am looking forward to another dose of Sammy and the Wabos and who ever else shows up!!! YAY!! I havent ever been to a birthday party so this will be my first.Im like a VIRGIN!! lol But I am no virgin to Sammies music.I saw him in Sacramento as Montrose in 1971 or 1972 and it was GREAT!!!! He was playing with Santana there at Cal-Expo.I cant wait to see how much he has grown as far as concerts go.I love the song MAS TEQUILA and I swear I hope he does it......nice and LONG....I love guitar solos.Thats what is missing in the bands now adays.Most just dont put out the added effort to make it great like SAMMY does!!! It is our anniversary.......We will be there for sure. We'll be there for the first time!!! Cant wait till October !! C U in CABO Oct 4th-11th ! !